October 10 marks the 11th World Day Against the Death Penalty, and the United States remains one of the top five countries in the world for executing its citizens — along with China, Iran, Iraq and Saudi Arabia, according to Amnesty International. The 43 executions we carried out last year happened in just nine states; 15 of them were in Texas. In Louisiana's notorious Angola prison, home to all men on death row in the state, those sentenced to death spend their final years locked in their cells alone for 23 hours each day. During summer, death row inmates are kept in their cells even though the heat index regularly exceeds 110 degrees. The prison does not provide them with clean ice or cool showers, but it does provide the public with tours of death row and the lethal injection table. At night, in an effort to keep cool, the men at Angola sleep on the floor where they are exposed to fire ants. When they "misbehave," they are moved to cells in the hottest tiers. Men have lived up to 28 years on Louisiana's death row, and most spend at least a decade in these dehumanizing conditions waiting for court appeals to go through. That is their due process. This April, Connecticut became the 17th state to abolish the death penalty, but without a federal repeal the U.S. may continue to be a world leader in executions. 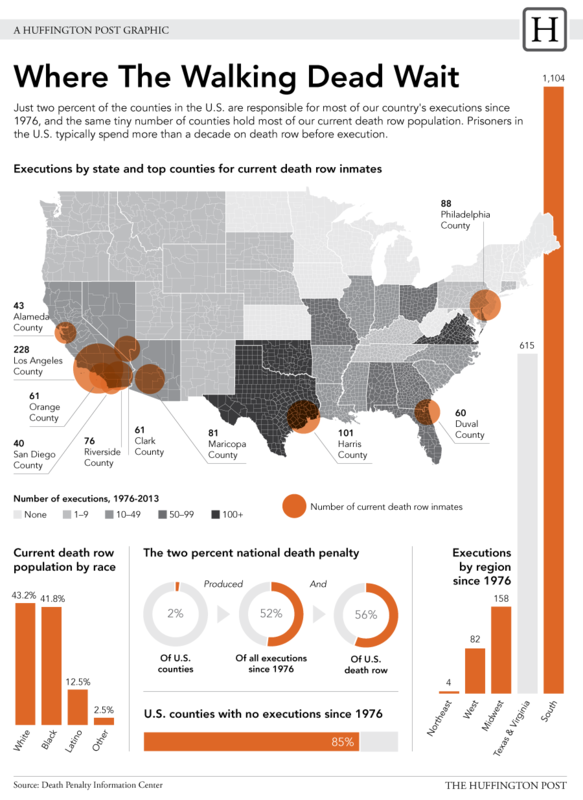 Just two percent of the nation's counties carried out the majority of the executions since 1976, according to a study released this week by the Death Penalty Information Center.